Fabricated thermowell assembly with 316 Stainless Steel probe and ANSI raised face flange. This flanged thermowell assembly is designed for use with thermocouples or resistance thermometers (Pt100’s). The ½” or ⅝” inch, 316 stainless steel sheath has a 7mm bore to suit 6mm diameter sensors. 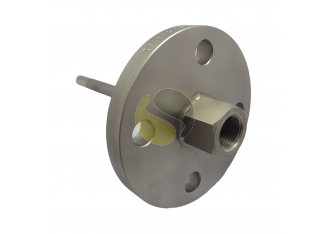 It has a fixed 150lb stainless steel, raised face flange which is available in ANSI 1”, 1.5”, 2”, 3” or 4” sizes for connection to a process or application. The internal fitting is a ¼” or ½” BSPP female thread with insertion depths to suit sensors or inserts. Our fabricated thermowells have many options available and can be manufactured to suit your application with 300 and 600lb pressure rating and DIN standard flanges available. In addition, lengths can be made to order and diameters to suit any probe, such as 3mm, 8mm, 10mm or 12mm. N.B The picture includes a terminal head for illustration purposes only. Terminal heads can be supplied separately upon request.